Living rooms tend to be the center of a home and often serve many different functions. Whether you’re relaxing with family to watch a movie or entertaining friends, you’ll want to create a room that is not only stylish, but also comfortable. Here are some rules of thumb for creating a welcoming space. The focal point of a room is usually something you immediately notice as soon as you walk into a room. Some rooms may have a built-in focal point like a picturesque window or fireplace, and sometimes you may need to create one. Either way, once you’ve identified your focal point, decorate and place your furniture around it. Don’t forget that the living room is a functional room! However you decide to layout your furniture, be mindful of its impact on the room’s functionality. Let the number of people you expect to hold and the room’s main usefulness direct the style, size and amount of furniture pieces you’ll need. Rugs are a great way to add texture and color to a room. They’re also a secret weapon to define spaces in an open concept room. Choose a rug that can be placed in the center of the room and have a least two legs of each furniture piece on it. You’ll want have 12 to 18 inches of bare floor between the edge of the rug and the walls. Keep at least 14 to 18 inches between the coffee table and sofa. This is enough to make it easy to reach for the remote but still have plenty of leg room. When choosing a table, pick one that is 4 inches (in either direction) of your sofa’s seat height. Using side tables? End tables should be around 3 inches shorter than the arm height of the seat. Is your chair armless? Aim for a table that’s no more than 8 inches above the seat. While the size of your television will ultimately determine the ideal distance it should be, a simple calculation to use is multiply the diagonal size of your TV by 2. That will give you the number of inches your set should be from the main seating area. Contrary to popular belief, you should actually be looking slightly down at the television screen. This helps to reduce reflections and improve the viewing experience. The optimal height for the center of the screen is 30 inches above the lowest seat height in the room (be sure to make the appropriate adjustments if you’re not mounting the TV on the wall). The center of an art piece should be kept at eye level, which is usually between 56 to 60 inches from the floor. 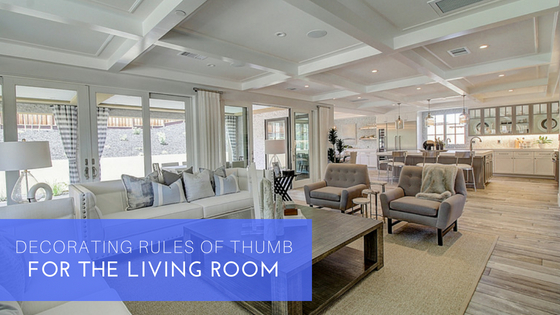 These basic rules of thumb will make decorating (or redecorating) your living room a breeze. You’ll be able to place your personal stamp with confidence.